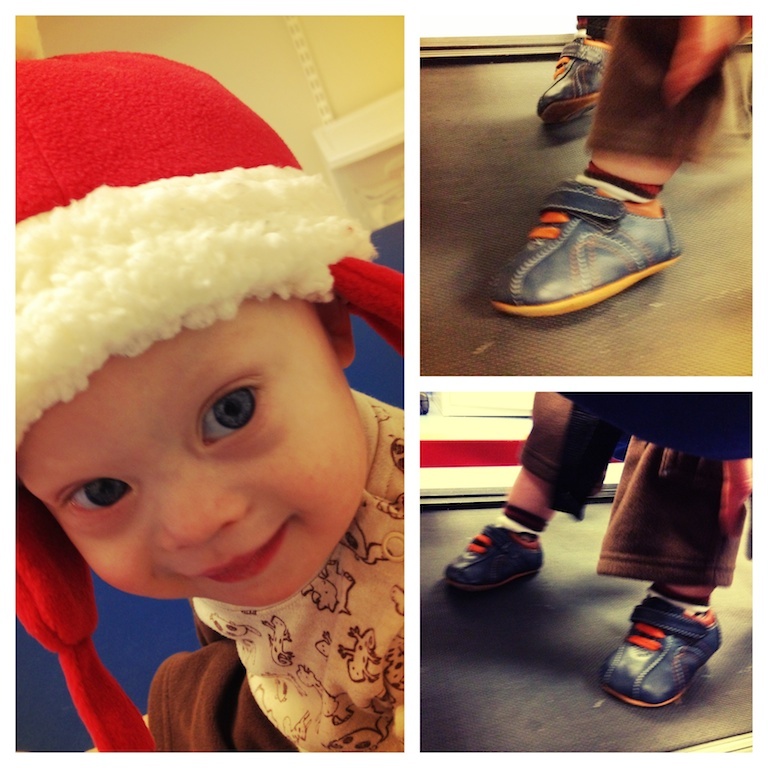 Noah physical therapist has been using treadmill training to help him learn to walk for 3 and a half months now. As you can see in today’s video he’s come a long way since he took his first “steps” on the treadmill in a few months ago. However, he still has a lot of work to do before he’ll actually walk on his own; specifically his core muscles, and balance. But he’ll get there. 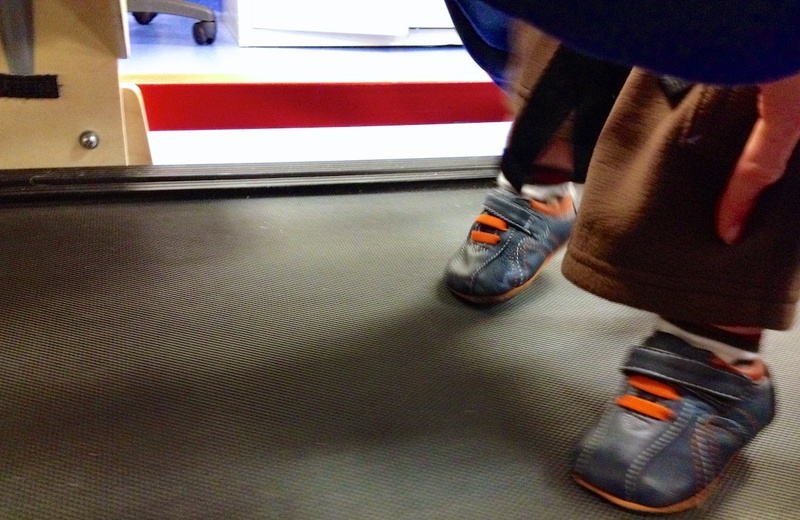 These feet were made for walking…. It’s a ton of fun seeing him figure out what his feet are for and watching him put one foot in front of the other. It seems like it’ll be forever before Noah takes his first steps (off the treadmill), and I can’t wait! But I also know that our kids grow up fast, so as much as I want him to walk, I also want to enjoy every second of his development, because once a child starts to walk on their own there’s no going back! (Can I get an “amen” parents?) I also want to be sure to never let parenting be a contest. As my wife and I often remind each other, we should focus on celebrating, not comparing. Why is your child on a treadmill anyway? Want to learn more about treadmill therapy? I just love this kid! For those of you interested in learning more about treadmill training for you child be sure to check how treadmill training can help your child with Down syndrome learn to walk. In addition Dr. Dale Ulrich (who is doing cutting edge research on motor behavior and development for infant with Down syndrome) sent us over the protocol for treadmill training for babies with Down syndrome which you can download for free! Feel free to print this out and share it with your child’s physical therapist if you’d like. What do you think about treadmill therapy? Has your child ever been on a treadmill? What other sorts of therapy has your child used? Tell us about it in the comments. begin this next week. Noah is doing wonderful. It really bothers me when people question me on if Levi is crawling or sitting up. I know he will do it when he is able. God has his back. Go Noah! I had plans to do treadmill therapy on our own, but it didn’t happen. Oh, well. Today we put James in a walker and let him loose in our church gym. We don’t do it often, and it’s fun to see the dramatic improvement each time–a good indicator that his PT time is helping! And I think it helps him to learn that his movements get him to interesting places, instead of just watching from afar. When James started walking holding on to our hands, he did great! We walked him across the street, down the hallway, into therapy, everywhere! But now he’s a stinker, and will only take a few steps at a time before pulling his feet up, unless he REALLY wants to go where we’re headed. He’s pulling up on things at home, and starting to cruise a bit! It seems that our best therapy has been big brother, Caleb, trying to keep his toys away from James. Caleb puts them all on the couch, which has been a big motivator for James to pull up! Our OT at home has suggested we keep all of James’s toys on couches, high(er) shelves, anywhere that would require James to work to get them. I have a question. Are there certain shoes that kids with Down Syndrome should wear? I have a parent who is asking and I honestly do not know. If you could advise, that will be great.